Cineplex 4 Ounce Copper Popcorn Machine. The Cineplex Popper features a brilliant textured finish desired by many. Designed for use in todays home theater and gaming rooms, the Cineplex is the perfect combination of quality and convenience only found in Paragons made in America popcorn machines! Designed with the home user in mind we placed the cord in the back and the graphics and storage door facing the operator. No brainers that make this a great consumer product! Matching brilliant textured stand built to fit for a custom single unit look has a wrap-around door. Brilliant textured color featuring a pitted, powder coat material treatment that is all the rage in high-end home accents. Each full-featured machine pops delicious, theater-quality popcorn in 3-5 minutes, is easy to use and easy to maintain. This popcorn machine creates 92 one ounce servings per hour for maximum output, and its spring-assisted kettle makes it easy to unload popcorn when it's done cooking. Its four-switch operation lets you effortlessly set this popcorn popper up, and the kettle "ready" lights let you know when you can add ingredients for cooking. The poppers top and bottom are colored red to grab the attention of your customers, and thanks to its aerated warming deck, this popcorn machine will keep your food warm while catching kernels and smaller bits for easy cleaning. Model: Cineplex 4 Ounce Copper. Output: 92 servings per hour. Actual Dimensions WxDxH: 16.5 x 14.25 x 23.5. High-output, hard-coat anodized aluminum kettle. Stainless steel foodzone and tempered glass panels. Tested to NSF/ANSI Standard 4 by ETL. UL 197 CSA 22.2 NO. 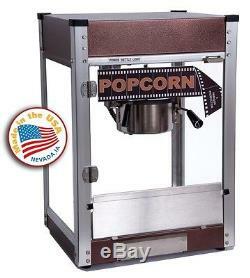 The item "Paragon Cineplex 4 ounce Popcorn Machine (Antique Copper)" is in sale since Monday, March 23, 2015.